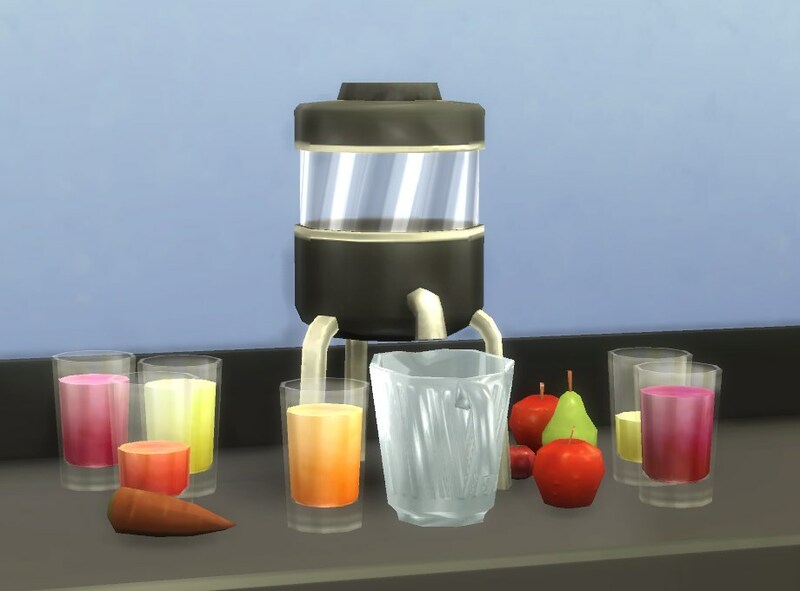 This is a functional juice blender that sims can use to make juice from apples, pears, carrots, tomatos, blackberries, grapes, or oranges. Update 2016-03-05: Updated with the rest of the Italian translation, revised Dutch translation, and Polish translation for the orange juice. 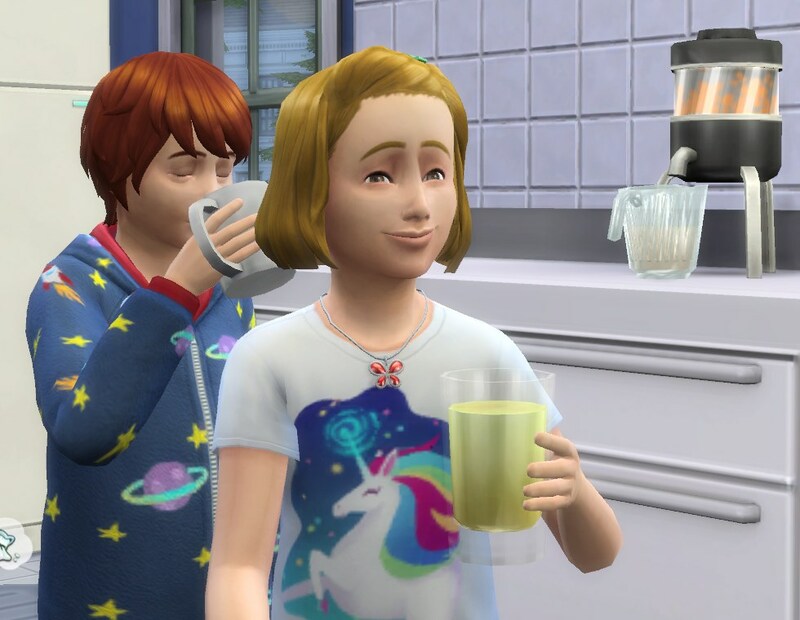 Update 2016-02-10: Updated blender + orange juice with Czech and some of the Italian translation (for the blender and orange juice, for the other juices I don't have translations yet). 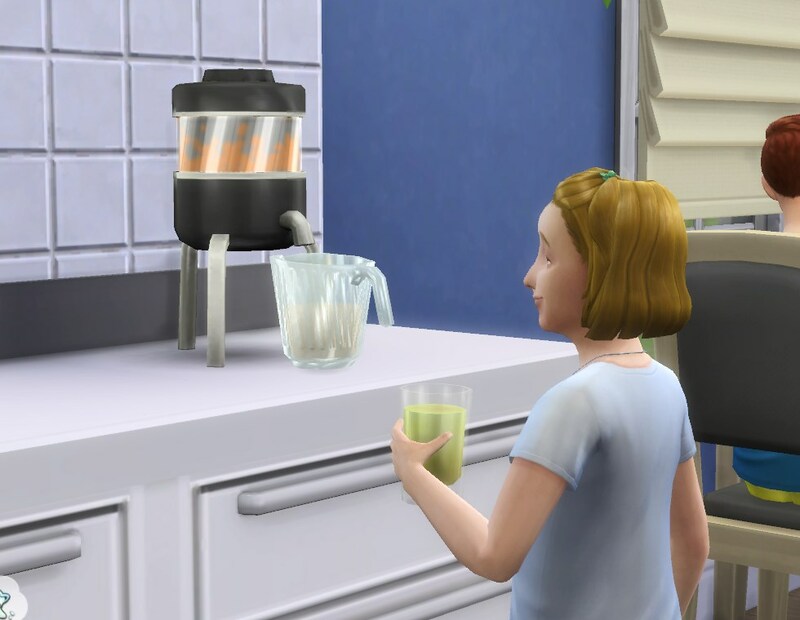 Update 2016-01-28: Updated blender + orange juice with corrected Brazilian Portuguese translations, and added Chinese to the juice. 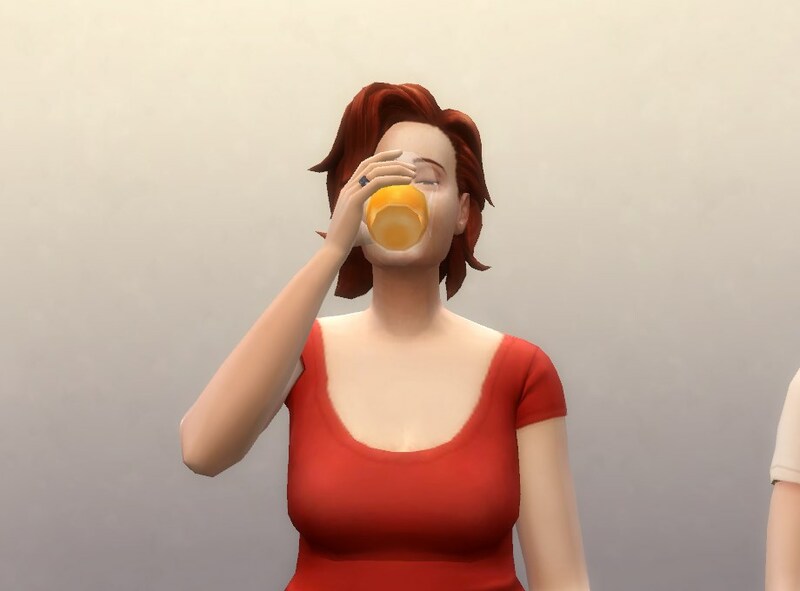 Update 2016-01-26: Norwegian translation added and Orange Juice added; it requires the harvestable oranges from this thread (Harvestable Orange Tree). 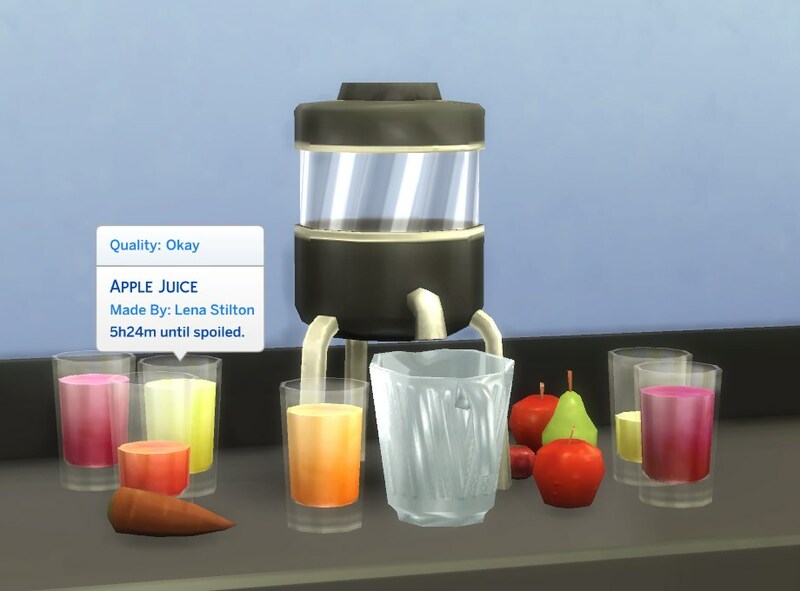 The updated juice blender and the new juice are in separate packages (so if you don't want the juice, just delete that package). 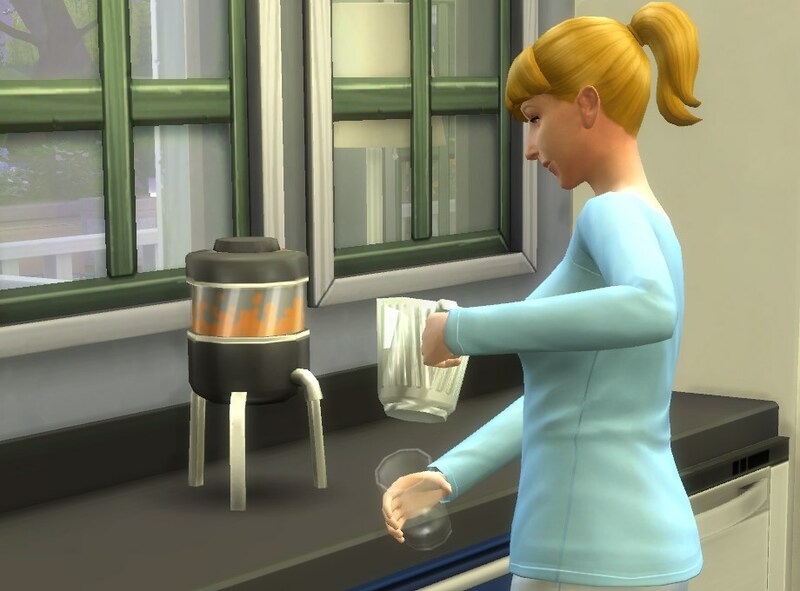 Update 2016-01-24: Added an interaction for children to grab drinks (when a full pitcher has been made), and the Polish and Portuguese translations of the Upgrade tooltip. Children will use the standard "Food_Grab" animation for this, since otherwise they would hover. Update 2016-01-23 II: Updated with additional translations for the new tooltip. 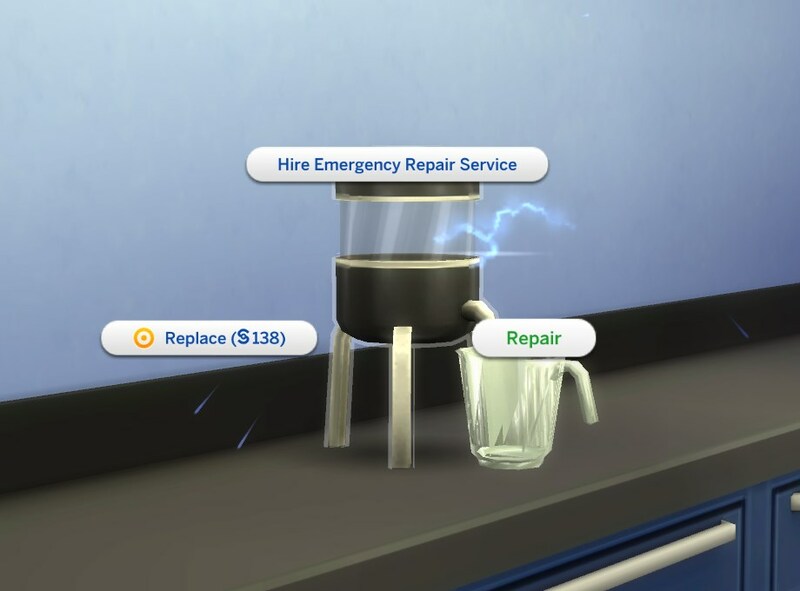 Update 2016-01-23: Updated with empty empty juice glasses and a custom upgrade interaction that talks about juice instead of coffee in the tooltip. Thanks to Menaceman44, KD9B, and coolspear1 for the feedback! Also includes egureh's updated Traditional Chinese translation. Update 2016-01-22: Russian translation added. Thank you! 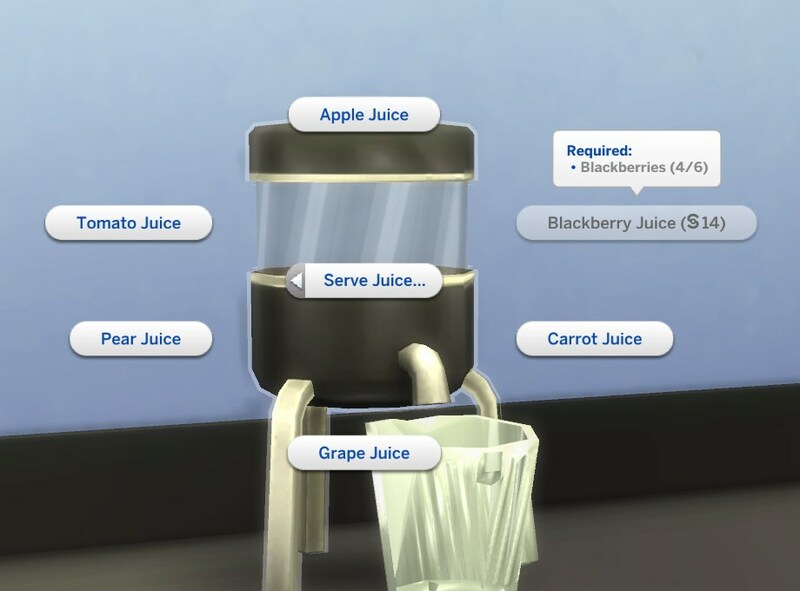 All juices require ingredients -- one fruit/vegetable for a single serving, six for a group serving. 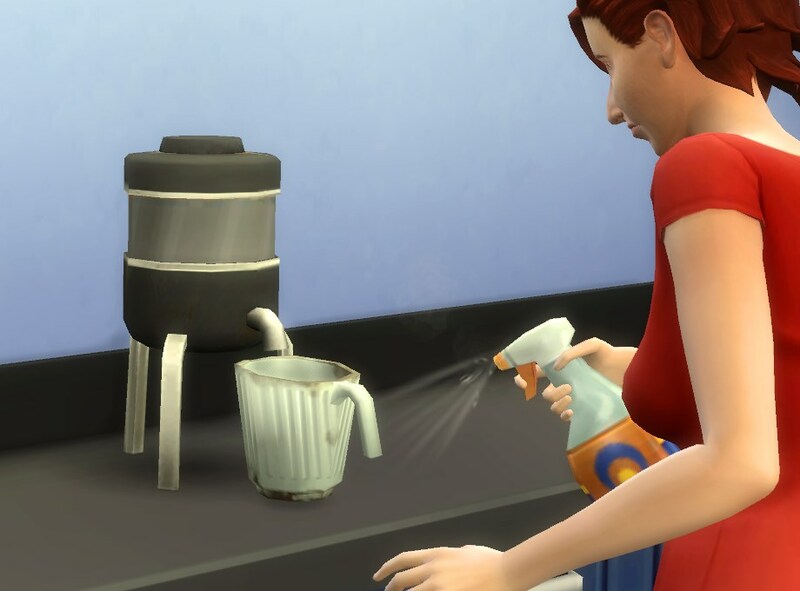 Ingredients are taken either from the sim or the fridge inventory (stuff in the fridge comes first). 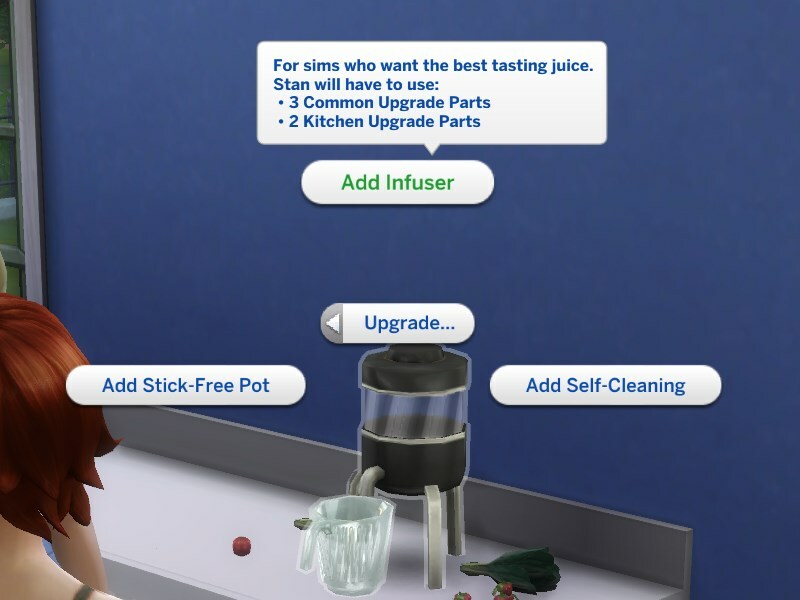 The better the ingredients are, the better the juice; but I’ve tuned it so that sims will drink “Okay” quality juice without making faces and ewwww-bleh noises (i.e. Okay actually means Okay, not “tastes like puddle”). Available in Small Appliances for 180§, teens and older can use it. 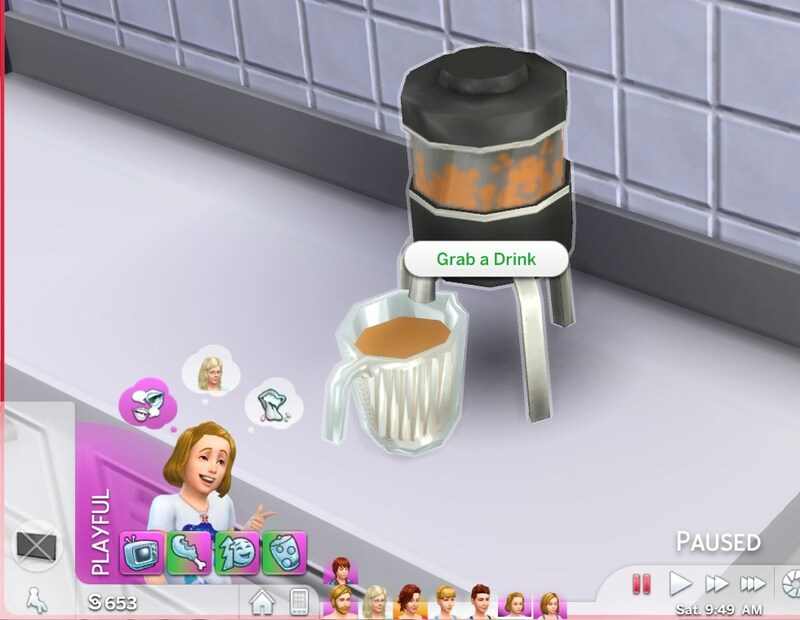 It is using the unchanged tea machine animations (including props, see the “Prepare” screenshots -- sims pour tea leaves into the machine etc), because in order to make custom ones *and* have sims route to the object right at the start, I would have to override S4_7DF2169C_00000000_0000000000003FCC cooking_Counter.xml (bad idea) or add on to it, and I haven’t yet figured out how to do the latter. 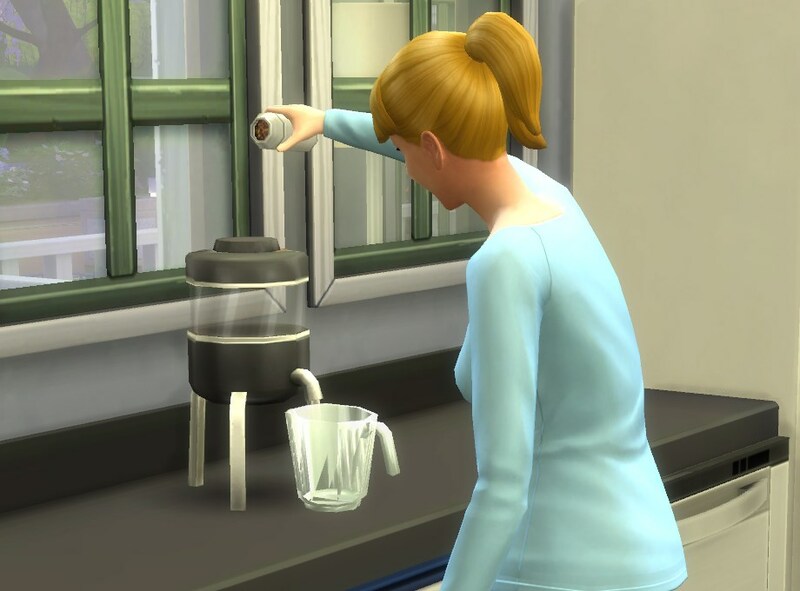 I assume it’s possible to do that (and probably even quite simple once you know how), but for now, there are tea leaves. The sounds are also from the tea machine but they actually fit quite well ‒ the boiling water is not too unlike mashing fruits into pieces. Use your imagination! 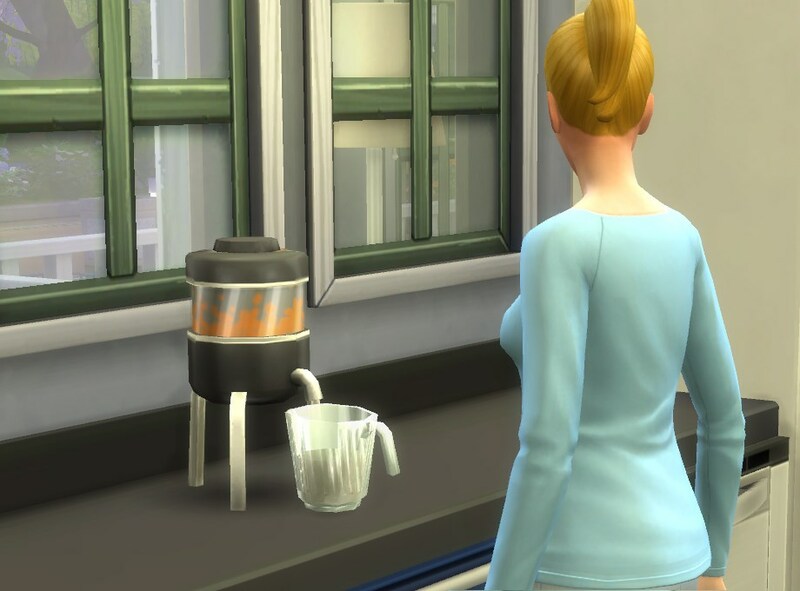 Right now the juice in the pitcher and machine (behind the glass) only has one colour option (it is always orange); I haven’t quite figured out yet how to set material states on the crafting object without breaking the actual crafting. Ideally this should of course match the colour of the juice that is being blended. This is also why it has only one olour option overall at the moment (black/dark grey, like on the screenshots). Also, on the “Prepare” screenshots + some others, the glass parts still have a different shader ‒ the final object looks like on the first three screenshots, where the glass on the pitcher is a bit milky (that is on purpose, to make the wrongly-coloured juice less obvious). 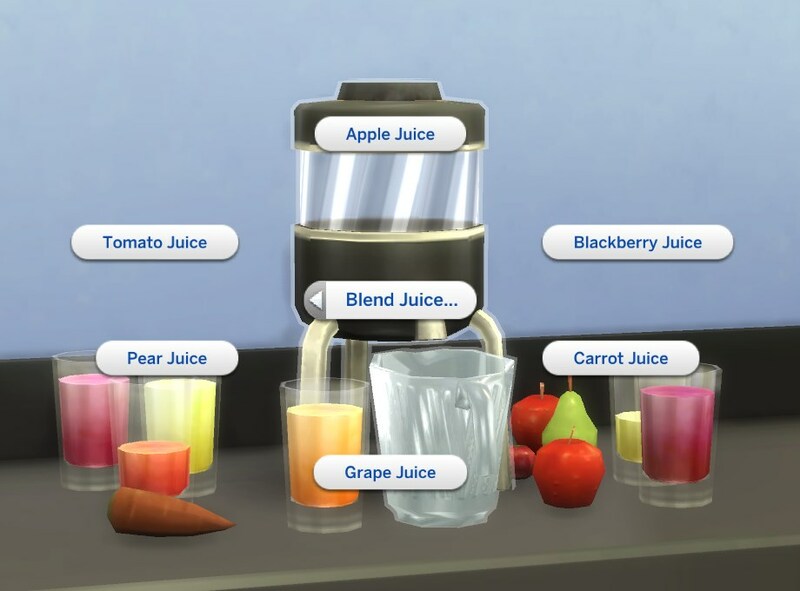 Blender and juices speak the following languages: US English (pbox), Simplified Chinese (wuccwzt), Traditional Chinese (egureh), Czech (Rynka_CS), Dutch (ElenaInTheSims), French (PharaohHound/Damabiah/MiniMimi), German (pbox), Italian (Ele88), European Portuguese (azoresman/simshout), Brazilian Portuguese (matheusmm94), Norwegian (therbon), Polish (hubi98), Russian (thesimsclub), Spanish (gato_24). Thank you all! 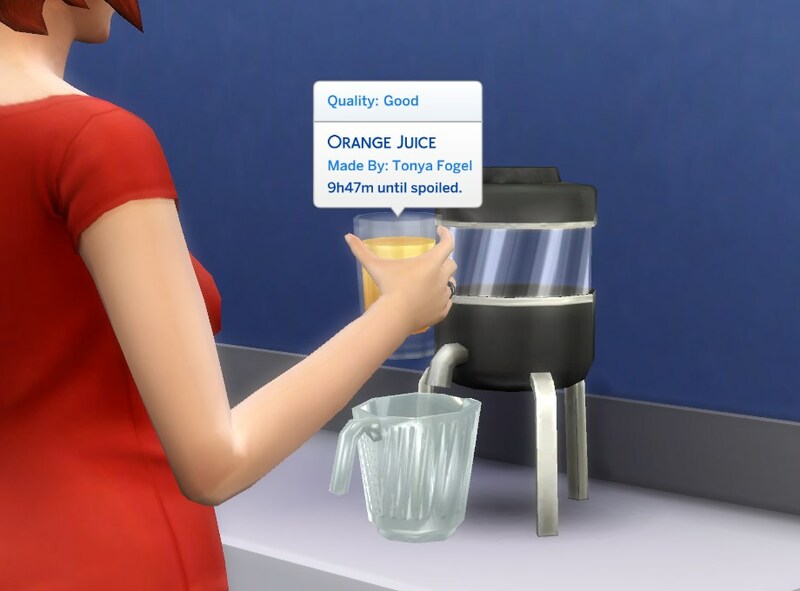 The additional orange juice has Engish, German, Dutch, Norwegian and French (I hope I got those right -- I learned all my Dutch from Sinaasappelsap packages! ), as well as Chinese (egureh), Italian (ele88), Polish (Piesek64), and Czech (Rynka_CS). 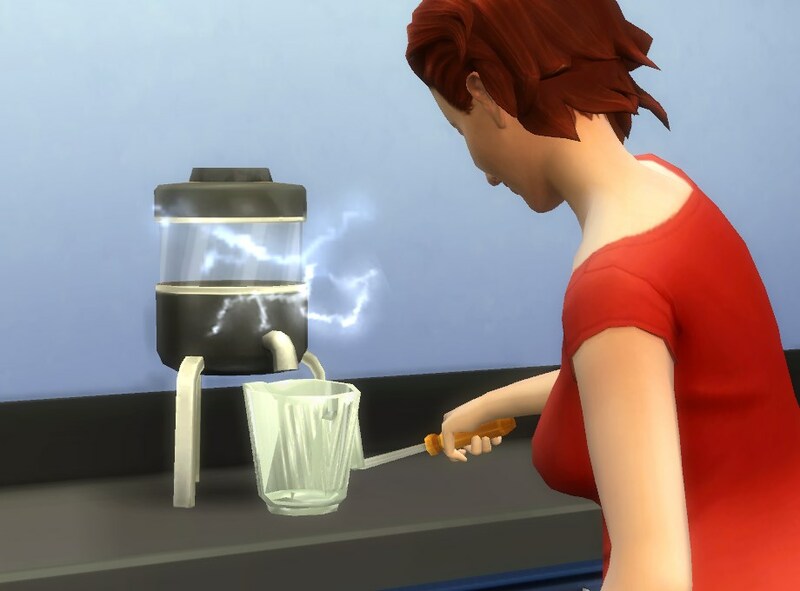 More contributions welcome; see here if you want to translate mods but don’t know how. blender, Paint.net, TSRW/Milkshape, XML Extractor, Notepad++, s4pe.